so we should not count that into consideration unless we scrutinize or present on the spur of the moment at the very spot.. Consequently I think we must not run only after supernatural occurence. 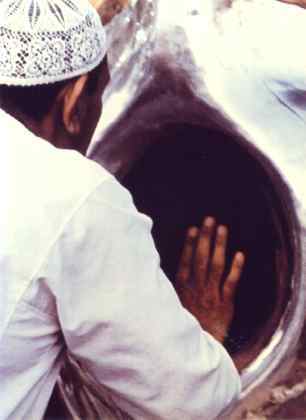 Our faith demands both akl (ration) and yaakin (belief of the unseen). that certifies the constriction of apparently seemed wide spectrum of time. In this context you also added the expansile nature of stars which is responsible for the red colour of the nebula. Yea thats true, and even this phenomenom of expansion is also mentioned in the Quran(chapter 51,verse47).It might have been a co-incident if the quraan had mentioned only one phenomena but we find the quraan mentioning about big bang, galactic explosion,expansion phenomena e.t.c ultramodern established facts in all together . 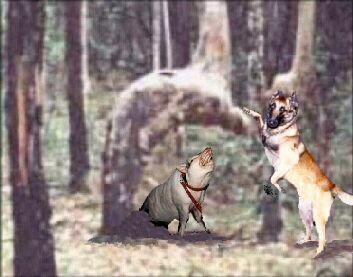 Now regarding the praying tree found in Sydney, I was not shocked for a dog and a pig being in the close vicinity of the tree but of the fact that how the scene had been created. You said that your friend dismayed as those creatures had gathered around but I think those had not by themselves rather those had been taken to gather around. In Australian jungles hounds are not available .The usual hunter animals are Dingo ( an animal of canine family). But suppose somehow a hound dog managed to reach there then was not it over smart for a pig to join there at the same time? My suspicion further grew to find the combination of specially two animals that excites muslim sentiment( as because pork is haram and taming dog is discouraged unless extreme necessity). Thats why I think those animals were used intentionally for fabrication or they were introduced into the picture by some other techniques. I agree with you that we should not confide upon supernatural events without scrutiny but at the sametime we must not support any forgery. Before I conclude Mr sina I would like to ask you to keep my following proposal that is just to go through a book and an article of my favourite.For that you have to download the both and download is absolutely free. N.B You need not mail me but if you wish you can. In fact it would be a pleasure for me if you manage few time from your busy everyday life and mindfully go through the aforementioned book and article. Thank you for your polite email. The Einstein's theory of relativity does not reduce the amount of time that light takes to reach the Earth. As far as we are concerned, that explosion happened 3000 years ago. Time is relative to the object that is traveling. Furthermore the speed of light is constant and the theory of relativity does not apply to it. 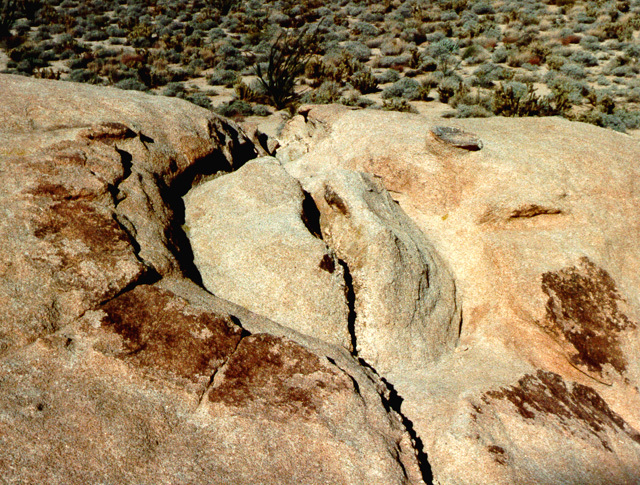 Our relative time on Earth is the same as we know it. Cat’s eye nebula is not the only stellar explosion. All stars will explode when they burn out their nuclear fuel. This will happen even to our sun. The birth and death of stars is as natural as the birth and death of humans. There is nothing extraordinary in that. Furthermore, these explosions (or implosions depending on the size of the star) are out of our skies. Our sky is what surrounds our Earth. What is happening in other solar systems are not our skies. So our heaven is not cleft asunder when stars in other parts of our galaxy explode. As I explained Muhammad was a prophet of doom and gloom. He was fond of scaring people into submission. When he said “And when the heaven splitteth asunder and becometh rosy like red hide”, he was talking about our own sky. He is talking of the dooms day. Look at the whole Surah. Have any of these things Muhammad is scaring people of happened yet? 027 But will abide (for ever) the Face of thy Lord,- full of Majesty, Bounty and Honour. As you can see here Muhammad is practicing his scare mongering tactics. He is talking about the perishing of the Earth. He is talking about punishment of Jinns and men with “flame of fire (to burn) and a smoke (to choke)”. And then he says that “sky is rent asunder, and it becomes red like ointment”. He is talking of the Day of Judgment when the men and Jinn will be brought to justice and “the sinners will be known by their marks: and they will be seized by their forelocks and their feet.” and "In its midst and in the midst of boiling hot water will they wander round!" Muhammad here is talking about his favorite subject, the Hell and the day of Judgment. Everything he says here, including that drill “then which of the favours of your Lord will ye deny?” is intended to induce fear in his followers and scare them so they dare not doubt or question his ridiculous claims. These tales of doom and gloom and the Day of Judgment have nothing to do with a star exploding 3000 years ago somewhere in our galaxy. It is just pathetic that Muslims’ brains have shrunk so much that they need to resort to such ridiculous explanations to fool themselves into believing that the Quran, which is full of absurdities contains scientific facts. The word used here is moosiAAoona which drives from word vaseun. It means vast. It has nothing to do with expanding. When you say al rezwano vaseun (the garden is vast). It does not mean that the garden is expanding. Any Arab standing in the clear nights of the desert could lookup at the sky and see that it is vast. Muhammad is stating the obvious. There is nothing scientific in this. However the verse 5 of the chapter we discussed above is unscientific. This is again based on the observation of the primitive people who could see the Sun and the Moon rotating around the Earth in a fixed course. This is obviously not so. As far as the Earth is concerned the Sun is fixed and the moon is rotating. Also Jinns do not exist. These are all childish tales. As far as the praying tree and the pilgrimage of a dog and a pig, that is a caricature. The intent is to make fun of the childish beliefs of the Muslims. These things are fluke of the nature. They are not messages for the believers. Look at the following picture. 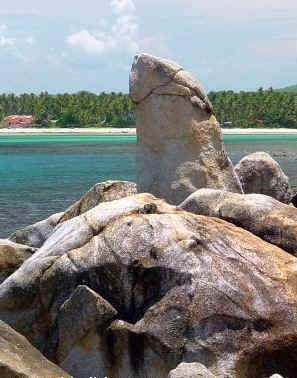 What message do you think Allah is trying to convey here? Dear Rezwan, these are fluke of the nature. Nobody is sending any messages. Only Muslims are so intellectually bankrupt that see messages in clouds, in trees, in tomatoes, etc. As for Mr. Haroun Yahya, we invited him to debate with us. He did not respond. A Muslim pleaded with him and he sent him an email telling him he will but this is now several months since and we have not heard of him. Would you be kind enough to contact this gentleman and tell him we are waiting?